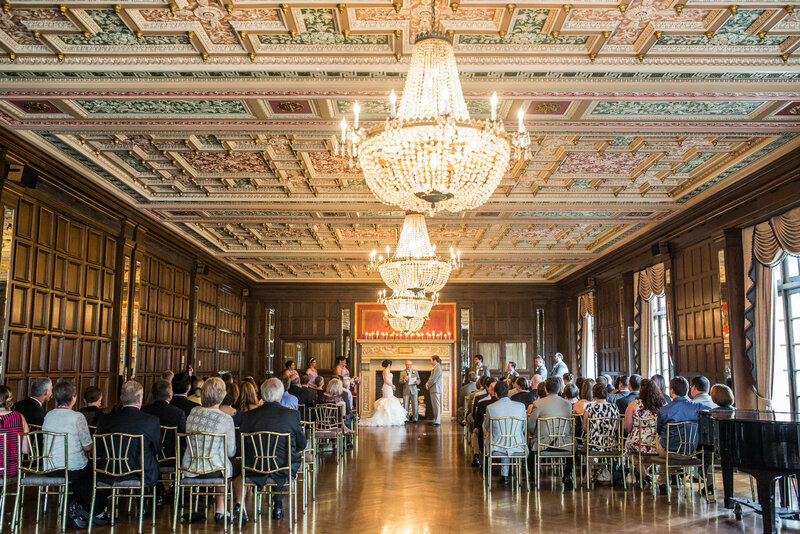 Romance and elegance set the stage for weddings held at The Athletic Club, from the guests' arrival at the gorgeous Italian inspired building to the Old World charm of the interior. Ornate details can be found throughout, from an intricate grand fireplace to original coffered ceilings. A stunning ironwork staircase leads guests along the stone steps to the main event area, a majestic light-filled room that is reminiscent of grand ballrooms found throughout Europe. This lavish space offers exquisite crystal chandeliers, beautiful hardwood floors and stunning floor-to-ceiling windows that capture the Columbus skyline. The room's showpiece, however, is the magnificent ceiling design that features intricately carved and painted details across the length of the room. The Athletic Club is a full-service event venue that provides in-house wedding planning as well as on-site catering. The venue is perfect for both ceremonies as well as receptions and can also accommodate additional wedding events such as bridal showers, welcome receptions, and rehearsal dinners. The Athletic Club is an ideal event space for ceremonies for up to 200 guests and a seated dinner reception for up to 325 people. Wedding ceremonies can be held in front of the formal white fireplace, where elegant gold chairs can be set up in theater style. Receptions are held in the ballroom which offers a large entertainment area in addition to table seating in a banquet style. One of The Athletic Club's most unique offerings is its array of amenities that can be found throughout the club. Eight newly-renovated guest rooms are available to rent, giving wedding couples the opportunity to provide high-end accommodations to members of the wedding party or family and friends. Additional features of The Athletic Club include access to other high-end amenities including an old-fashioned bowling alley and billiards room. These distinctive features not only add to the charm of the wedding venue itself but also make perfect spots to capture extraordinary and memorable wedding photos. According to Wedding Spot, rental fees for ceremonies and receptions range from $750 to $1,500 and includes up to seven hours of event time as well as set up and break down. An average wedding at The Athletic Club for 100 guests is estimated to cost between $11,385 and $22,866 for both a ceremony and a reception and includes catering, tables, chairs, and linens. Established with a mission to foster both athletic and social endeavors within the greater Columbus area, The Athletic Club embodies a deep sense of community and history. Though athletic opportunities are certainly at its core, this private club is also deeply rooted within the Columbus community and boasts an impressive guest and member list that include former presidents, supreme court justices, and global business leaders. Making its home in a stately six-story building in central Columbus, The Athletic Club serves as one of the city's esteemed examples of Spanish Renaissance Revival architecture. The club has worked tirelessly to retain its original charm and grandeur and celebrated its long history when it was listed on the National Register of Historic Places in 2012. 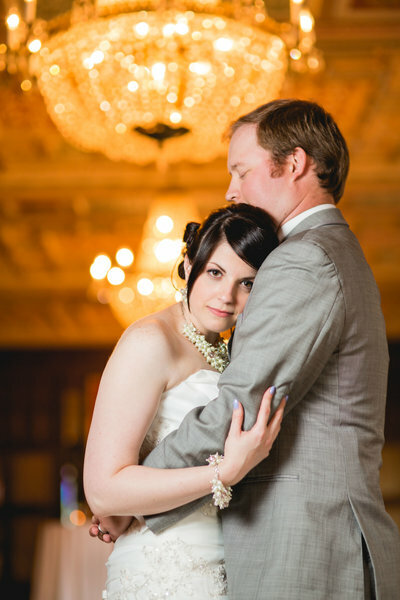 Click to see Andrea & Steve's incredible wedding at The Athletic Club. 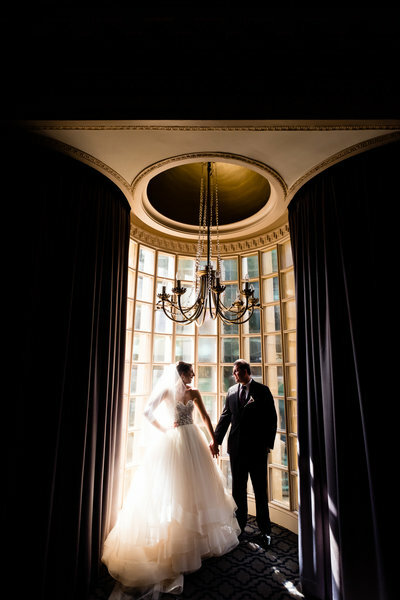 Click to see Rachel & Richard's incredible wedding at The Athletic Club. 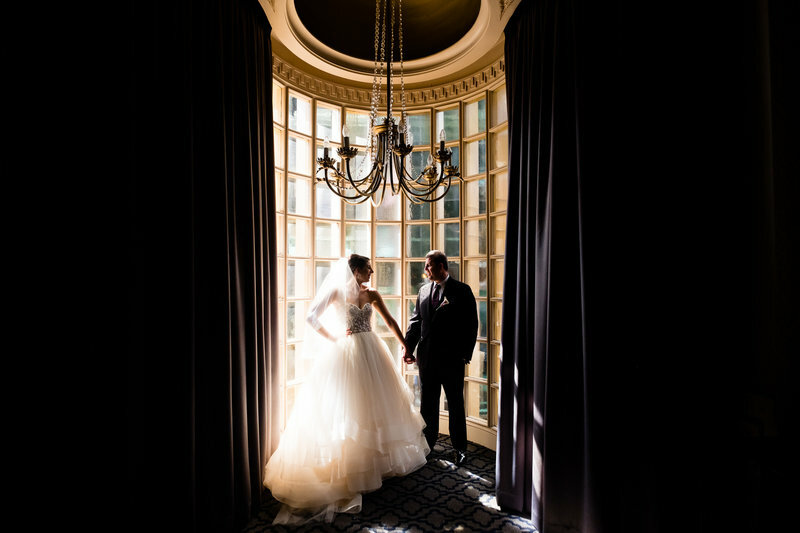 Click to see Cathy & Mike's incredible wedding at The Athletic Club.